Hairy hats and hairy feet . . . Hair that doesn't smell too sweet! The pages of this book are crammed with every imaginable sort of hairiness. 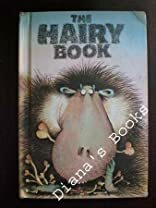 From hair on your head and hairy legs, hairy noses and hairy chests to smelly hair and itchy hair, hairy skirts and hairy shirts. About Babette Cole (Author) : Babette Cole is a published author and an illustrator of children's books. Some of the published credits of Babette Cole include Beware of the Vet (Picture Puffin), If I Were You, That's Why!.